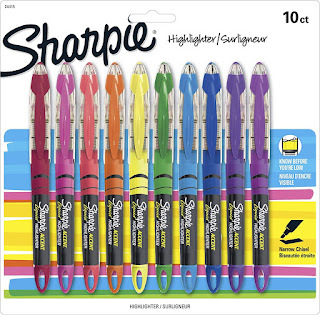 Right now you can get these Sharpie Liquid Highlighters, Chisel Tip, Assorted Colors, 10 Count for ONLY $6.50 (Retail $12.49)! With smooth-flowing liquid ink and a precision chisel tip, the Sharpie Liquid Pen Highlighter is perfect for a variety of highlighting and underlining needs. Highly pigmented ink provides saturated, brilliant color, and the see-through barrel makes it easy to keep an eye on your ink supply. A loop at the base of the Sharpie Liquid Pen lets you attach the highlighter to planners, 3-ring binders and bags, so you can make important highlights and lines wherever you go.